Item is a photograph of the convent in Arichat. Item is a photographic postcard of the Arichat government wharf. 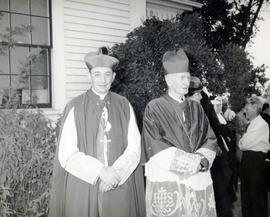 Item is a photograph of Bishop Landry (left) and Bishop Morrison (right) in Arichat. Item is a photograph of the court house in Arichat, Cape Breton. Item is a photograph of the doorway by the Southeast corner of a stonehouse in Arichat, with John Dunton holding a pole. Item is a photograph of the first graduates of Arichat College. Item is a photograph of the Lenoir Forge in Arichat, Cape Breton. Item is a photograph of the gravestone marking the burial of musician Michael "Little Joe" MacNeil. Mr. MacNeil is buried in West Arichat. Item is a photograph of the inside view of the North end wall of the stonehouse in Arichat. Item is a photograph of the exterior view of the Northeast wall of the Arichat stonehouse. Item is a photograph of the Southeast corner of the old forge stonehouse, Arichat. Item is a photograph of John Dunton at a stone house in Arichat. Item is a photograph of the Southeast corner of an old stonehouse in Arichat. Item is a photograph of Rev. Alexander Chisholm who was ordained on November 19, 1866. Item is a photograph of the interior of the West long wall of the Arichat stonehouse, with I.C. Walker standing in the fallen portion of the East wall.